Not everyone gets a headache with the common cold, but for those who do it can be an extremely unpleasant symptom. On this page Dr. Jen Tan discusses what causes this headache, and what you can do to ease it using home, herbal and conventional methods. One of the many unpleasant symptoms of the common cold is a headache. This can make day to day jobs more difficult, especially if your headache worsens when exposed to bright lights or when you bend over. Most people find that their headache is concentrated around the forehead, eyes and cheekbones. What causes headaches with a common cold? The most likely cause of your headache is sinus congestion. When you have a cold, you often produce more mucus in your nose in order to flush out bacteria. However, if too much mucus is produced, or if your nasal passages become inflamed and swollen, then this mucus can become trapped, causing a blocked nose. This blockage can cause increased pressure in the head, particularly around your sinuses. These are hollow cavities in your skull that can be found around your nose, under your eyes and in your forehead. The sinuses themselves can also become swollen and inflamed. A tell-tale sign of sinus problems is a throbbing headache when you bend over. Looking at this diagram of the sinuses, it’s easy to see why headaches with the cold tend to be focused around the forehead, eyes and cheekbones. The best way to relieve the pressure in your sinuses and thus relieve your headache is to loosen any congestion in your nasal passages. One way to do this is using steam inhalation. Fill a bowl with hot, steaming water and gently breathe the steam in through your nose. The heat and moisture can help to loosen congestion. Add a few drops of essential oils such as eucalyptus or peppermint (found in our Po-Ho Oil) to aid this process. We’d also recommend drinking plenty of water, as headaches can be worsened by dehydration. Extra water will also keep the mucus in your nose as thin as possible, helping it to drain better. To treat the overall symptoms of a cold or flu, we’d recommend Echinaforce. The liquid tincture works fastest, but you may find the tablets more convenient. 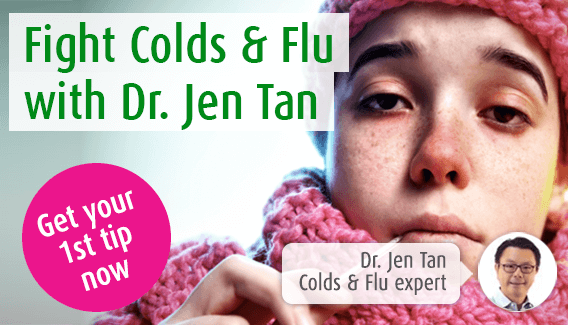 Echinacea helps to strengthen the immune system to help your body recover from a cold or flu. You might find the Echinaforce Hot Drink particularly useful for relieving symptoms, and the heat of the drink can help to relieve congestion. To help relieve congestion specifically, a nasal spray such as our Sinuforce Nasal Spray may be useful. It contains essential oils such as eucalyptus and peppermint to help clear congestion, relieving the pressure on the sinuses. This should help to ease your headache. Again, anything that helps to clear congestion can be good for headaches associated with a cold. Chemical-based nasal sprays can also be purchased from pharmacies and health stores, but these often have more contraindications than herbal varieties. Simple pain killers like Paracetamol can also help to ease headaches if you are struggling to relieve congestion around the sinuses.